It's also thinking of giving Stories a more prominent location on its desktop layout. Unlike its Instagram counterpart, Facebook Stories hasn't been doing as well. The social network even launched Instagram-to-Facebook crossposting and merged it with one of its other Snapchat clones, Messenger Day, over the past few months in an effort to get more people to use it. But it doesn't look like Facebook is giving up on it anytime soon -- according to TechCrunch, the company has begun testing the ability to post Stories straight from desktop. It's also testing a new design that puts Stories above the desktop News Feed, similar to the feature's more prominent placement on mobile. At the moment, you can view Stories on desktop, but you can find them on the side bar instead of in the middle of the page. "We are always working to ensure people can easily navigate and enjoy Facebook, regardless of how they connect. 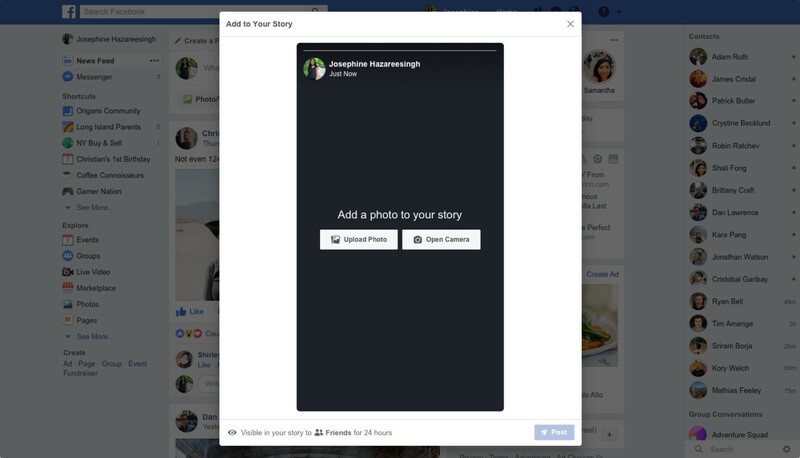 We are testing the option to create and share Stories from Facebook on desktop and are also testing moving the Stories tray from the top right corner to above News Feed, just like on mobile." By putting Stories front and center on desktop, Facebook is giving vloggers who prefer recording themselves on their webcam a new platform. It's also making the feature more alluring for advertisers: a Digiday report even says the company is putting an AR team together in London, which will be in charge of pitching sponsored AR filters to advertisers. If the company's plan pans out, you can expect to see branded overlays in Instagram's and Facebook's ephemeral feature in the future.